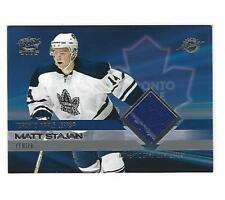 This item is a 2012-13 O-Pee-Chee Signatures Card #OPC-MS of Matt Stajan. The scans of both sides of the card is the card you will receive for this item. This is a great card overall! I would rate this card as least NM-MT or better. MATT STAJAN. 2006-07 BAP PORTRAITS SP - SJ. BEAUTIFUL AUTOGRAPHED HOCKEY PHOTO CARD ! 8 X 10 AUTOTOGRAPHED PHOTO. Matt played for the Toronto Maple Leafs. The card is numbered # 39 in the set. The serial number is # 315 of # 850. Then I can send a combined invoice. I have listed. You are purchasing a:Alexander Steen / Matt Stajan Upper Deck Artifacts Tundra Tandem Jersey Card from the 2007 / 08 season. Alexander & Matt both played for the Toronto Maple Leafs. The card is number # TT-AM in the set. 4 MATT STAJAN Toronto Maple Leafs serial #'d cards including 3 2003/04 rookie cards, as follows 03/04 UPPER DECK TRILOGY ROOKIE PREMIERES LEVEL ONE (Ser#157/999). You are bidding on the exact card picture and described in the title. Please check the pictures carefully. If you see more than 2 photos per card, additional pictures are of damage to the card. We do combine shipping. From 2004-05 AHL Future Stars set, this is the Matt Stajan card. 2005-06 Upper Deck SP Authentic Matt Stajan SCRIPTS FOR SUCCESS, CERTIFIED AUTHENTIC AUTOGRAPHED insert card! This card is machine stamped#001/100. YES, this is the VERY FIRST card off of the press, considered a. Card ships in a sleeve, top loader, team bag, and bubble mailer. Matt Stajan 03/04 11-RC Lot "w/SP".